DOWNSCALE 2013, the 2nd international workshop on downscaling the Semantic Web was held on 19-9-2013 in Geneva, Switzerland and was co-located with the Open Knowledge Conference 2013. The workshop seeks to provide first steps in exploring appropriate requirements, technologies, processes and applications for the deployment of Semantic Web technologies in constrained scenarios, taking into consideration local contexts. For instance, making Semantic Web platforms usable under limited computing power and limited access to Internet, with context-specific interfaces. The workshop accepted three full papers after peer-review and featured five invited abstracts. in his keynote speech, Stephane Boyera of SBC4D gave a very nice overview of the potential use of Semantic Web for Social & Economic Development. The accepted papers and abstracts can be found in the downscale2013 proceedings, which will also appear as part of the OKCon 2013 Open Book. We broadcast the whole workshop live on the web, and you can actually watch the whole thing (or fragments) via the embedded videos below. After the presentations, we had fruitful discussions about the main aspects of ‘downscaling’. The consensus seemed to be that Downscaling involved the investigation and usage of Semantic Web technologies and Linked Data principles to allow for data, information and knowledge sharing in circumstances where ‘mainstream’ SW and LD is not feasible or simply does not work. These circumstances can be because of cultural, technical or physical limitations or because of natural or artificial limitations. Hardware/ Infrastructure. This aspect includes issues with connectivity, low resource hardware, unavailability, etc. Interfaces. This concerns the design and development of appropriate interfaces with respect to illiteracy of users or their specific usage. Building human-usable interfaces is a more general issue for Linked data. Pragmatic semantics. Developing LD solutions that consider which information is relevant in which (cultural) circumstances is crucial to its success. This might include filtering of information etc. The right side of the picture illustrates the downscaling stack. 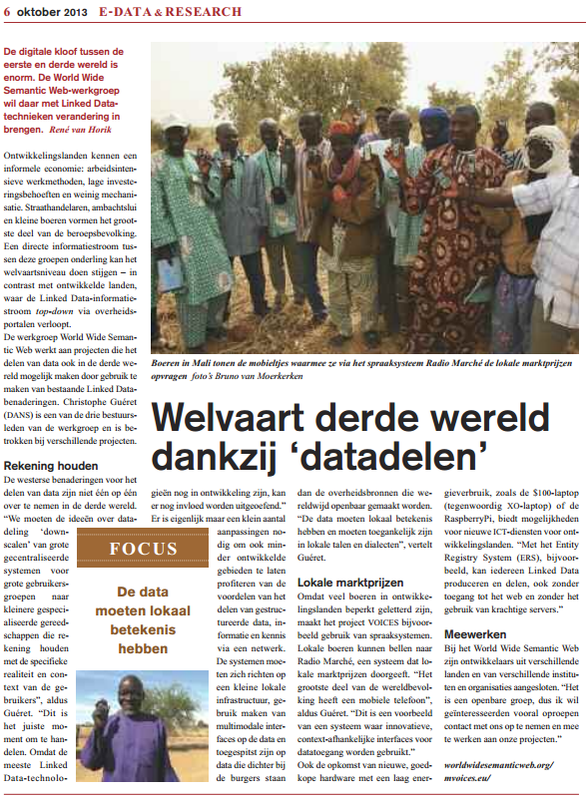 The October edition of the KNAW’s E-Data and Research magazine features an article submitted by Christophe Gueret, Stefan Schlobach and myself on the need for facilitating data sharing in developing regions. Our submission was rewritten into a nice interview-like article, which you can find on page 8 (and copied below). The article is in Dutch.